Let Weis Pharmacy provide you with a preventative immunization for Flu. Flu shots are available at all Weis Pharmacy locations. Shots are available on a walk-up basis at most pharmacy locations while supplies last, as well as at pre-scheduled clinics. Free with most insurances. Let Weis Pharmacy provide you with preventative immunizations to help keep you in the best of health. Stay in the best of health with a wide range of vaccination services from your Weis pharmacist. All Weis pharmacists are certified by the American Pharmacists Association and authorized by the State Board of Pharmacy to administer vaccines. These services are available for those 18 or older and are covered by many prescription Insurance programs, including Medicare part B and D.
Careworks Walk-in Medical Clinics, located next to the pharmacy in some stores. Do you want to make one trip to the pharmacy to pickup all your medications? Coordinate your prescriptions to be ready on the same day each month. We'll call or text to remind you to refill and pickup your medications. We'll call your doctor for refills. To Your Good Health - $9.99/90 Day Rx plan = 11 cents a day! At 11 cents a day*, we’re making your good health our primary concern. Our 90 day $9.99 prescription drug plan includes hundreds of generic drugs. In many cases, your price will be lower than your insurance or mail order co-pay. ** We make it easy for you to save money and get the medication you need. * Based on commonly prescribed dosages. Weis Pharmacies offer FREE multivitamins with fluoride for children up to seven years of age. Simply present your Weis Pharmacist with a fluoride prescription from your child's pediatrician to receive a one year supply. Speak to any of our Weis Pharmacists for more details. View our Children's Vitamin Brochure here. 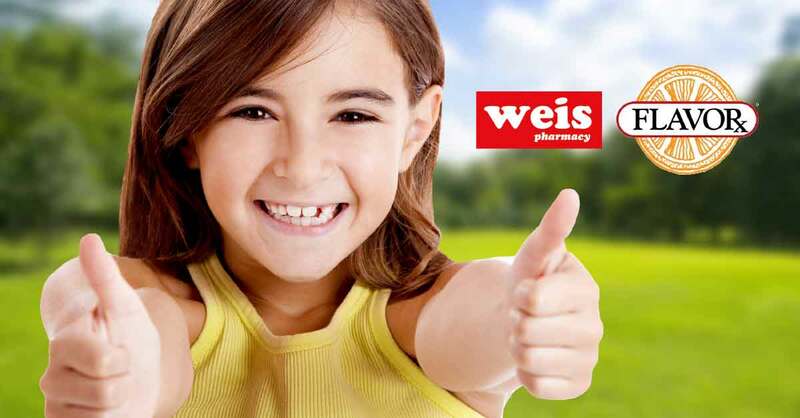 Did you know that your Weis Pharmacy can change the taste of your child’s prescription medications and over the counter products with FlavoRx? See your pharmacist for details. Ask your Weis Pharmacist about Pet Medications. They're the same medications that your pet currently uses and priced lower than most veterinarians. You can even have the pharmacist contact your veterinarian for you! Tick Care from Weis Markets! Want to learn more about tick care? Click here to learn more about tick care and the products we offer to help you with this!